EDC provides education for designing, constructing, remodeling, operating and maintaining the sustainable built environment as the official magazine for the LEED professional. EDC has been the premier source for integrated high-performance building since 1997. 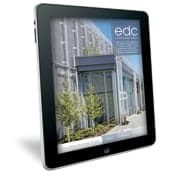 Through leadership and quality integrated media, EDC continues to be the foremost and only monthly magazine in the green building industry. We are committed to maintaining high-quality, BPA-audited circulation, award-winning editorial, quality research, growth and industry relationships. It’s easier than ever to stay connected to the best source of news and information. Become a part of our online communities and access exclusive information, breaking news, real-time event coverage and much more! Edcmag.com is a participant in the Amazon Associates Program, an affiliate advertising program designed to provide a means for sites to earn advertising fees by advertising and linking to Amazon.com. Amazon, the Amazon logo, AmazonSupply, and the AmazonSupply logo are trademarks of Amazon.com, Inc. or its affiliates. Copyright © 2019 - EDC Magazine. All Rights Reserved.